Most office-based work involves sitting still at a desk, rarely being relaxed and often coping with high stress loads. Being sedentary for long periods of time leads to back and neck pain. In the past, bed rest was prescribed, however the modern approach is to keep the back moving. 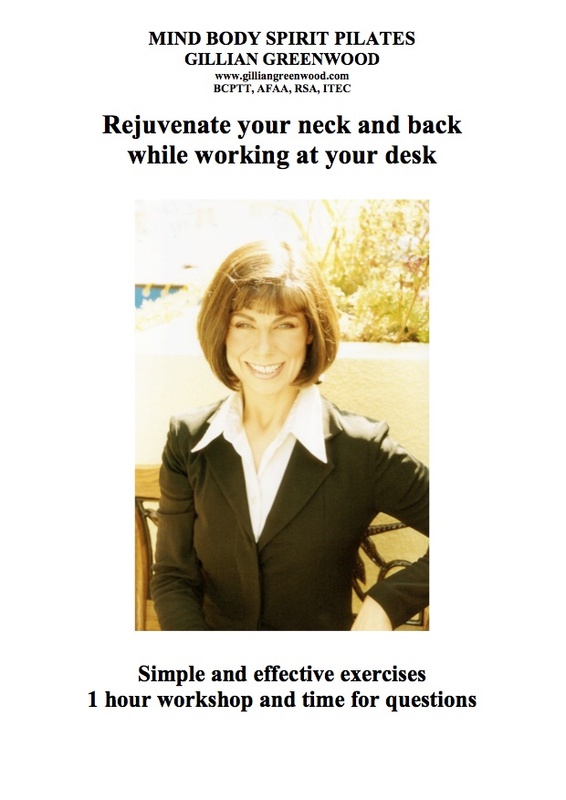 Therefore, desk-bound personnel need a satisfactory remedy if they are to avoid facing neck and back pain. 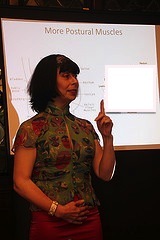 I have drawn on my expertise as a Pilates, lifestyle and stress management teacher and my experience of working in offices (often coping with tight deadlines and being desk-bound for hours on end) to put together my simple, yet effective workshop. It begins with a brief explanation of why our postural muscles are key to improving our position and avoiding pain and stiffness. I explain where the postural muscles are and how to engage them. We then move on to the fun, practical component giving everyone the opportunity to engage their postural muscles and experience how to perform everyday movements efficiently by taking the stress out of the lower back and neck, thus relaxing muscles that are being used unnecessarily. The exercises include turning the head whilst keeping the spine lengthened, moving the spine one vertebra at a time and mobilising the shoulder joints; all performed with the finesse, we have just learned, to incorporate our postural muscles. The exercises can go unnoticed in the workplace, only one repetition is beneficial and they can be performed in any order at any time of day. I round up the session with useful tips, including the arrangement of furniture, tips to combat eye-strain … and then I answer questions. Equipment needed: chairs or sofa screen/ powerpoint or I can bring handoutsI am a trained dancer, gymnasium instructor and a well-established Body Control Pilates® and lifestyle teacher in Chelsea. I have over twenty years teaching experience and gained my education in Los Angeles and London. I also teach pre/post-natal exercise, stress management, present workshops, write articles for health magazines and am a personal trainer and masseuse. I am an AFAA Associate Consultant and Examiner (Aerobic Fitness Association of America). I was awarded the highest score in the Evening Standard survey of London Pilates Instructors: “Gillian has a touch of the guru about her”. I have been featured in The London Paper, The Daily Telegraph, The Evening Standard and ES Magazine. I have written book reviews for Health and Fitness Magazine. I teach Pilates teacher training courses. Over the years my clients have included: Flora Fraser, film director John Irvin, singer Marcella Detroit, The Princess of the Arab Emirates, The Princess of Thailand and Julian Clary. Julian has written a 1,000 word foreword to my book “Pilates and Lifestyle” which will be published later this year. Single session £100, discounts for 2 or more sessions.